Vitamins are an important part of a healthy diet. You get the majority of your daily vitamins by eating foods like vegetables, whole grains and lean meats. The 13 types of vitamins are categorized as either fat-soluble or water-soluble. Fat-soluble vitamins are absorbed into your body fat, where they are stored for later use. These include vitamins A, D, E and K. The water-soluble vitamins dissolve in water, and what your body does not use is then eliminated through your urine. 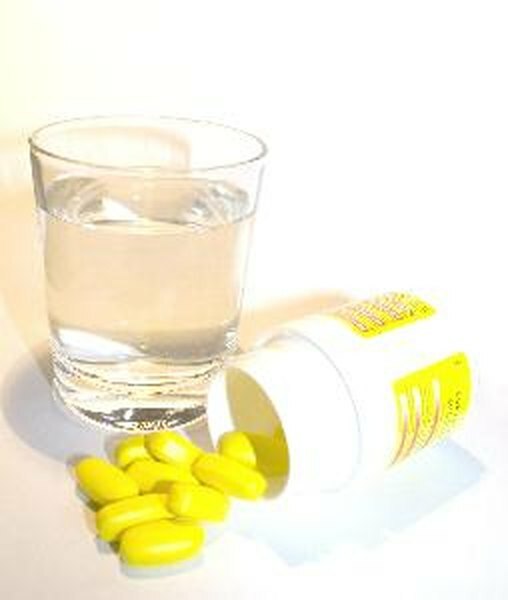 Vitamin C and the B-vitamins are water-soluble. On a molecular level, vitamins are not biochemical building blocks for the body, but they do act as coenzymes. Enzymes are proteins or other types of molecules in your body that make chemical processes go faster. Vitamins paired with your existing enzymes aid in numerous biological functions, such as metabolism, and in maintaining cellular health. All vitamins do this, and the water-soluble vitamins must be replenished daily to supply the support your body needs from that particular vitamin's coenzyme action. Vitamin C is a coenzyme for connective tissue formation, and the B-vitamins are coenzymes for the breakdown of fats, carbohydrates and proteins. Vitamin C, or ascorbic acid, is an antioxidant that protects your organs from free radical damage. Free radicals are created in your body during a process called oxidation, when your body breaks down ingested chemical substances from food or after inhalation of environmental pollutants. This vitamin also has a role in boosting your immune system and in the synthesis of critical neurotransmitters in the brain that impact your mood. You need a daily dose of vitamin C to maintain these important functions. The recommended dietary allowance for women is 75 milligrams. Food sources include citrus fruits, red bell peppers, berries, tomatoes, broccoli and leafy greens. Eight types of vitamins compose the B group. Together the B group functions as coenzymes to help your body get energy from food. They also keep your nervous system and brain healthy. Individually, certain B-vitamins like folic acid play a role in preventing birth defects during pregnancy, while vitamin B-12 aids in the preservation of memory during aging. You need daily intake of the B-vitamins. Food sources for this group include whole grains, beans and lentils, dairy foods, fish and lean meats. Vitamin B-1, or thiamine, is recommended at 1.1 milligrams daily for women and vitamin B-2, or riboflavin, is recommended at 1.1 milligrams daily for women. Women need 14 milligrams of vitamin B-3, or niacin, per day and 5 milligrams of vitamin B-5, or pantothenic acid. Women require 1.3 milligrams of vitamin B-6 per day and 30 micrograms of vitamin B-7, or biotin, on a daily basis. Vitamin B-9, or folate, is recommended at 400 micrograms for women, but the necessity of this vitamin during pregnancy to prevent birth defects is set higher for women planning to become pregnant or are already pregnant at 600 micrograms per day. Women need 2.4 micrograms of vitamin B-12 each day.